On the last couple of trips from Portsmouth I have noticed a sharp increase in security. Mirrors looking under cars and luggage searches, that sort of thing. I don't have a problem with this. However on the last trip both my son and I and a pannier each were searched via an airport type scanner. When travelling, even if not camping, I usually take my Swiss Army camping knife. This was not in the searched pannier but was in the bar bag so not detected. However this might be the case next time so I have emailed the company to establish their policy but have so far not received a reply. Has anyone experienced the discover of a penknife they were carrying and what happened then. Brittany Ferries, Portsmouth - St Malo in June. 3 individual cyclists were taken from the line and had one bag scanned, a bag selected by the security person. My saddlebag was selected and of course that has all my tools including a large Swiss army knife. Security did not bat an eyelid. They had a big box of kitchen knives and similar that they had confiscated, big knives at that. Same at Dover with P&O a couple of years ago. I was asked if I had a knife or similar and I owned up to the Swiss army knife. Again, no problem. They won't have changed the law, methinks, but might have a different policy about discovery. I expect there's all sorts of directives coming down from on high, after recent awful events over there. And we should remember that there's a recent trend of the use of knives as 'terrorist' weapons in the Middle East. Looks like I should be alright next June then. As I said security was certainly much tighter this year than in any previous year in which I travelled. I suppose sadly it is a sign of the times that they are now more concerned with weapons than smuggled goods. At this years Pedal on Parliament I joined a queue of us wanting to use the facilities within the Scottish Parliament building. To get in you have to go through security putting phone and metal objects into a tray which passes through as you walk through. A guy 3 or 4 places in front of me put his penknife into the tray. Discussion ensued and the outcome was that it was confiscated. I changed my mind and returned outside to hang on a bit longer. I've had a knife in my pocket for 45 yrs , I always carry one, I'd feel naked and useless without. Not once dreamed of using it to do anyone harm. Paulatic wrote: At this years Pedal on Parliament I joined a queue of us wanting to use the facilities within the Scottish Parliament building. To get in you have to go through security putting phone and metal objects into a tray which passes through as you walk through. A guy 3 or 4 places in front of me put his penknife into the tray. Discussion ensued and the outcome was that it was confiscated. I changed my mind and returned outside to hang on a bit longer. Confiscated or not allowed to take it in (i.e. able to get it back after)? When I got called to jury service I realised that as I arrived at court one day I had a mini leatherman in my pocket. I handed it in on arrival and got it back when I left. If in doubt, bring a stout stamped addressed envelope so that you can post it home if they won't let you take it. I would have thought any travel company saying "can't travel with a knife" would have allowed you to surrender your knife to them, they carry it securely and you collect it on arrival at your destination. On a flight once Amsterdam to San Jose (Costa Rica) and we stopped-off at Curaçao dropped of a few passengers and quite a few boarded and the flight attendants at the top of the steps (by the "kitchen where you board) had a bucket for people to put their knives in and it ended up pretty full by the time I got back on board. And the bucket stayed with the flight attendants and I assume everybody sorted out their knives once we landed. It was all pretty relaxed. But you were not meant to carry knives so they looked after them for you through the journey. It has been standard on airlines for many years although some might say it hasn't always worked. I had a penknife confiscated at Heathrow and handed back to me in a prominent hazards bag in Amsterdam. Consequently security in Amsterdam immediately wanted to search my luggage. This would have been fine had my wife and I not had identical cases and I'd picked up hers. Interesting trying to explain the contents!! I'm still awaiting a response from them. If I do get one I will report back. That policy is a bit of a laugh considering all the caravans being towed on board with fully-equipped kitchens! Indeed and I usually have two small butane canisters with me but this particular trip didn't. Might also be an issue in the future though. Just a thought - what sort of knives do they have in the restaurants on board, I am pretty sure they are metal ones? Load of old cobblers! If it was a (non-locking) folder with a blade of less than three inches, whoever told him that was simply wrong (and in the place where that was explicitly made law too! ). That said however, any business (premises or carrier) can make their own rules about what you are allowed to have on your person whilst on their property. So you can be legitimately told "You cannot bring that in here" when 'that' is a perfectly legal penknife. I think it's a lot to do with the upbringing of whoever is wearing the uniform. I was given a sheath knife with 4" blade aged around 8 and have always carried a knife. I think they are an essential tool and fortunately I've never witnessed them used otherwise. But imagine if you've been brought up in a home where you were never allowed to own one, never really had a purpose for one. Perhaps you've only ever seen one to be used to attack or threaten someone? I think that person has a different outlook to me. 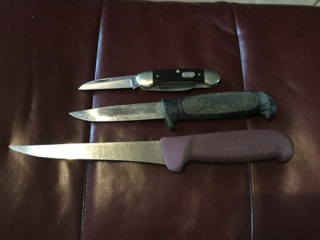 Below is a picture of my knives. The top one is a pocket one I always have on me. The other two, when I was working, were always in my van laid beside the seat. I never used to think about it at the time but I can now imagine what a police officer would make of it after pulling me over.